GopherCentral Library: Where is Stepfanie Kramer? Don't break the law or else you'll have to deal with "The Brass Cupcake"! That's right! 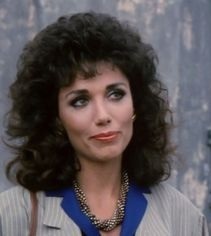 Today, star of the hit NBC cop show Hunter, actress Stepfanie Kramer is our featured celebrity! It would be a crime not to see what she's been doing these days. Oh, and remember to click here to see the rest of today's issue: Where is Stepfanie Kramer? And your vote counts! I added NEW celebs to our celebrity suggestions list very recently so be sure to go to Celebrity Suggestions check out who's in the running and VOTE or send in your suggestions. Vote UP or DOWN on all of the listed celebrities. And vote as many times as you want! Oh, and be sure to check out our Facebook page Where Are They Now on Facebook. Please follow us, like us, and share us this your friends. It's much appreciated! WATN will be posting new issues, classic issues, and movies reviews, which can also be seen on our website at the Movie Review Directory. Trouble Sleeping? Try This Super-Comfy Weighted Blanket Sleep Weel, Stress Less & Feel Great! Hope Lange: She starred in the TV series "The Ghost and Mrs. Muir" and appeared in many movies, including "Peyton Place", "Death Wish", and "Blue Velvet"
CLAIM TO FAME: Stepfanie Kramer is an American actress, writer, and singer/songwriter best known for her role as detective Sgt. Dee Dee McCall on the NBC series Hunter (1984-1990). FAMILY LIFE: In 1992, Kramer married Mark Richards. Together they had a daughter, Lily. Kramer and Richards later divorced in 2001. INFO: Kramer was born and raised in Los Angeles. Her father was a violinist with the Los Angeles Philharmonic. She's part Native American on her mother's side. Trained as a Mezzo Soprano with extensive theatre and musical credits. Graduate of The American Acadamy of Dramatic Arts. In 1986, Kramer stated she was working on a rock album with composer Mike Post, who had penned music for Hunter. Stepfanie was honored by the "First Americans in the Arts Awards" in 1995, 2002 and 2003 by winning the award for Outstanding Performance as a lead actress. This award is only given to artists of Native American decent. Kramer's first album One Dream came out on October 12, 1999; it contains 10 adult contemporary songs. Most are original songs. The Great American Song Book, her second album, came out early in 2008. Kramer covers 14 classic songs recorded live in a one-woman show which she performs in various national venues. In 2008, she represented the U.S. by performing at the International Music Fesival in Queretero, Mexico. Kramer writes and develops both films and television with notable writer/producers David Chisolm and Chip Hayes. She has been a guest instructor at The American Academy of Dramatic Arts teaching Master Acting Class. TRIVIA: Was almost cast as Lucy Ewing on Dallas (1978). Due to the fact that her enormous Hunter (1984) co-star Fred Dryer is a foot taller than her, she had to stand on an egg crate while they were in the same shot so that both of them could be seen. On Hunter, he character's badge number is 358. And here nickname during the first two seasons was "The Brass Cupcake". WHERE IS SHE NOW: Stepfanie's latest movie role is in the drama Crossing, which is currently in post-production. Aleksey Buldakov, 68, Russian actor, heart attack. Maatoug Adam [ar], 88, Libyan politician, Minister of Tourism (1968-1969) and Interior (1969). Rovshan Almuradly [ru], 64, Azerbaijani actor, director and screenwriter, heart attack. Kim English, American house and gospel singer and songwriter. Bill Heine, 74, British radio broadcaster (BBC Radio Oxford), leukaemia. Musharrafa Kosimova [tg], 101, Tajik stage actress. J. Mahendran, 79, Indian film director (Mullum Malarum, Nenjathai Killathe, Kamaraj) and actor. Jamshid Mashayekhi, 84, Iranian actor (Brick and Mirror, The Fateful Day, Abadan). Nikolay A. Sazhin [ru], 70, Russian artist. Andrzej Trzos-Rastawiecki [pl], 85, Polish film director. Don Williamson, 85, American businessman (Brainerd International Raceway) and politician, mayor of Flint, Michigan (2003-2009), complications of respiratory illness. Enrique Álvarez Conde [es], 67, Spanish academic (King Juan Carlos University), lung cancer. Giacomo Battaglia, 54, Italian comedian, complications from a stroke. Caravelli, 88, French conductor and composer. Dimitar Dobrev, 87, Bulgarian wrestler, Olympic champion (1960). Romano Marchetti, 106, Italian partisan. Francisco Massiani, 74, Venezuelan writer and painter. Vonda N. McIntyre, 70, American science fiction author (Dreamsnake, The Crystal Star), pancreatic cancer. Kit Napier, 75, Scottish footballer (Brighton & Hove Albion, Blackburn Rovers). Yisroel Avrohom Portugal, 95, American rabbi, Rebbe of Skulen (since 1982). Rafael Sánchez Ferlosio, 91, Spanish writer, Cervantes Prize winner (2004). Dilip Sarkar, 61, Indian politician, liver and kidney disease. Ron Sweed, 70, American entertainer, heart attack. Armando Vega Gil [es], 64, Mexican writer, composer, and musician (Botellita de Jerez), suicide by hanging. Vodka, 14, Japanese racehorse, laminitis. S. Pierre Yameogo, 63, Burkinabé film director and screenwriter. Peter Coleman, 90, Australian politician and writer, Leader of the New South Wales Opposition (1977-1978), member of the House of Representatives (1981-1987). Cesare Dujany, 99, Italian politician, MP (1979-1996), President of Aosta Valley (1970-1974). Natalia Fileva, 55, Russian business executive (S7 Airlines), plane crash. Charles Foster, 65, American Olympic hurdler (1976). José Antonio Gurriarán, 80, Spanish journalist. Corrado Hérin, 52, Italian luger and mountain bike racer, plane crash. Barrie Hole, 76, Welsh footballer (Cardiff City, Aston Villa, national team). Nipsey Hussle, 33, American rapper ("Feelin' Myself", "FDT"), shot. Nikolai Makarovets [ru], 80, Russian missile launcher designer (NPO Splav). Vatzlav Moshinskiy [uk], 84, Ukrainian film director. Hedi Turki, 96, Tunisian painter. Billy Adams, 79, American rockabilly singer and songwriter. Greg Booker, 58, American baseball player (San Diego Padres, Minnesota Twins, San Francisco Giants), melanoma. Paloma Cela, 76, Spanish actress (Forty Degrees in the Shade, Cry Chicago, The Legion Like Women), stroke. Ron Elvidge, 96, New Zealand rugby union player (Otago, national team). Maurice Hardouin, 71, French footballer. Geoff Harvey, 83, Australian musician and music director (The Mike Walsh Show, Midday). Hendrik Laridon [nl], 84, Belgian politician. Simaro Lutumba, 81, Congolese musician (TPOK Jazz). Tania Mallet, 77, English model and actress (Goldfinger). Michele Russo, 74, Italian Roman Catholic prelate, Bishop of Doba (1989-2014). Ruben Tovmasyan, 82, Armenian politician, First Secretary of the Armenian Communist Party (2005-2014). Ben West Jr., 78, American politician, member of the Tennessee House of Representatives (1985-2011). Mark Alessi, 65, American comic book publisher, founder of CrossGen. Sue Bradburne, 70, British racehorse trainer. Allan Cole, 75, American author and television writer. Srima Dissanayake, 76, Sri Lankan lawyer and politician. Anders Ehnmark, 87, Swedish author and journalist (Expressen, Norrskensflamman, Folket i Bild/Kulturfront). Joe Enook, 61, Canadian politician, member (since 2011) and Speaker of the Legislative Assembly of Nunavut (since 2017). Dobrica Eric, 82, Serbian writer and poet. Josep Esteve i Soler, 89, Spanish pharmaceutical executive. Kenneth A. Gibson, 86, American politician, mayor of Newark, New Jersey (1970-1986). Joshua Hecht, 91, American operatic bass. Ho Tao, 82, Hong Kong architect (Hong Kong Arts Centre) and designer of the flag of Hong Kong, pneumonia. Jim Holt, 74, American baseball player (Minnesota Twins, Oakland Athletics). Margaret Lewis, 79, American singer-songwriter ("The Girl Most Likely", "Reconsider Me"), pneumonia. Marco Antônio Eugênio Martini, 70, Brazilian actor, complications from brain cancer. Max Querrien [fr], 97, French politician. Shane Rimmer, 89, Canadian-born British actor (Thunderbirds, Dr. Strangelove, The Spy Who Loved Me). Renzo Tortelli [it], 92, Italian photographer. Agnès Varda, 90, French film director (Cléo from 5 to 7, Le Bonheur, Vagabond), cancer. Ed Westcott, 97, American photographer (Manhattan Project). Vladimir Basalayev, 73, Russian football player (Lokomotiv Moscow, Dynamo Moscow, USSR national team) and manager. Joe Bellino, 81, American football player (Naval Academy, Boston Patriots), Heisman Trophy winner (1960). Alphonse D'Arco, 86, American mobster, acting boss of the Lucchese crime family (1990-1991), kidney disease. Joe Flannery, 87, British music executive (The Beatles). Domenico Giannace, 94, Italian trade unionist and politician, member of the Regional Council of Basilicata (1980-1985). Pierre Lacroix, 84, French rugby union player. Maury Laws, 95, American television and film composer (Rudolph the Red-Nosed Reindeer, Frosty the Snowman, The Little Drummer Boy). Koji Nakanishi, 93, Japanese chemist. Kevin Randall, 73, English football player and manager (Chesterfield, York City). Damir Salimov, 81, Uzbek film director. Eva Mae Fleming Scott, 92, American politician, member of the Virginia House of Delegates (1972-1979) and Senate (1980-1984). Fuyumi Shiraishi, 82, Japanese voice actress (Mobile Suit Gundam, Patalliro!, The Monster Kid), heart failure. Garry Sidebottom, 64, Australian VFL footballer (St Kilda, Geelong, Fitzroy), cancer. Jon Skolmen, 78, Norwegian actor (Sällskapsresan, Hodet over vannet). Bob Stewart, 79, British radio presenter (Radio Luxembourg). Yuri Tomashov [ru], 89, Russian military equipment designer, Hero of Socialist Labour (1990). Henry Stern, 83, American politician and government official, member of NYCC (1974-1983), Commissioner of NYC Parks (1983-1990, 1994-2000), complications of Parkinson's disease. Wong Tien Fatt, 64, Malaysian politician, MP (since 2013), heart attack. Steve Wormith, 72, Canadian football player (Montreal Alouettes) and psychologist, cancer. Friedrich Achleitner, 88, Austrian poet and architecture critic. Ashitha, 62, Indian writer, cancer. Dragan Bošnjak, 62, Serbian footballer (Spartak Subotica, Vojvodina, Dinamo Zagreb). Pierre Bourguignon, 77, French politician, Deputy (1981-1993, 1997-2012), mayor of Sotteville-lès-Rouen (1989-2014), heart attack. John Browne, 82, Irish politician, Senator (1983-1987) and TD (1989-2002). Valery Bykovsky, 84, Russian cosmonaut (Vostok 5, Soyuz 22, Soyuz 31). Roy Eugene Davis, 88, American spiritual teacher, heart failure. Edit Doron, 68, Israeli linguist. Jan Dydak, 50, Polish boxer, Olympic bronze medalist (1988), cancer. Stephen Fitzpatrick, 24, British rock guitarist and singer (Her's), traffic collision. Valentino Giambelli, 91, Italian football player (Olginatese, Monza, Gallaratese) and executive, Chairman of Monza (1980-2000). Gilbert Gross [fr], 87, French media marketing executive (Dentsu Aegis Network). Jan Kobylanski, 95, Polish-Paraguayan union leader and stamp printer. Akihito Kondo, 80, Japanese baseball player. Audun Laading, 25, Norwegian rock musician (Her's), traffic collision. Reino Lehväslaiho [fi], 96, Finnish writer. John Permal, 72, Pakistani sprinter, pancreatic cancer. Dimitri Polizos, 68, American politician, member of the Alabama House of Representatives (since 2013), heart attack. Lawrence Rhodes, 79, American dancer and ballet director. Zinayida Tsesarenko, 82, Ukrainian theater actress, Merited Artist of Ukraine. Vera Urumi [sq], 87, Albanian actress. Bruce Yardley, 71, Australian Test cricketer, cancer.